Question: What is your company’s reason for being? Is it just to get people to buy products or hire you? Or is there something else you long to accomplish, and your business is merely the path toward this accomplishment? Also…why do you want to accomplish this purpose with your company? What is it about the world you seek to change or improve? As a founder of a business, understanding and communicating the purpose of your business, beyond turning a profit, is fundamental to its long-term growth. When you follow through on your business’s purpose by articulating your vision and acting on your company’s values, not only will you win more customers, but your customers will also be more likely to stick with you, through thick and thin. Sixty-seven percent of respondents said they feel companies with a purpose care more about them and their families. Seventy-nine percent of respondents said they’re more loyal to purpose brands, and 73% said they would defend them. Another 67% said they are more willing to forgive such a company for a mistake. Seventy-eight percent of respondents said they would tell others to buy from their companies and 73% would share content about that company. So if customer acquisition and loyalty is improved by having a purpose, why is it that so many companies stray from what they originally set out to do? A company’s purpose is only as good as the people who stay accountable and connected to it. 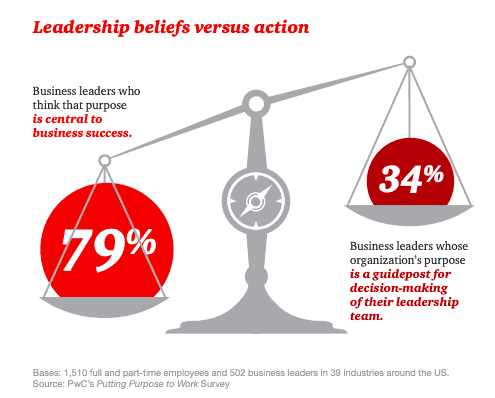 Only 34% of business leaders use their purpose as a guidepost for decision-making, and only 27%of business leaders help employees connect their own purpose to the work of the company. And in order for people to stay accountable to a mission, they need to know the mission—and why there’s a mission in the first place. Which means, you need to develop a damn good mission and vision statement. One that keeps your team focused, motivated, and inspired. One that drives your customers to engage with your brand, even if your company makes a few mistakes along the way. If you’re at a loss as to how to develop a motivating mission and vision statement for your business, read on: by the end of this post you’ll have all the tools you need to finally put your dreams and purpose into words—and action. Get The Simple Copywriting Techniques Behind 11 Multimillion-dollar Product Launches! Learn More Now. A mission statement clearly articulates your company’s purpose and how it goes about achieving that purpose. It helps the world understand your business’s reason for being. All that means, your mission statement is one of the most important communication pieces you can write for your business. Who Are Mission Statements for? Human resources experts would tell you that a mission statement is a motivational tool for employees. Product and brand managers would tell you a mission statement is a way to build trust with your customers. But ultimately, a mission statement is a guidepost for a company’s leadership. It’s a reminder of the promises you made to the world when you started your company. It’s a pledge to honor that promise, even when coming through on the mission becomes difficult. It’s a vow to innovate through the hurdles and deliver on the mission. And if you can’t complete your mission, it’s time for a new mission, and a new company. Unless you have a clear ethical compass, as an organization you are bound to damage and destroy your business over the long-term. We’re seeing that happen time and time again. Whether it’s the Volkswagen debacle, or Japanese airbags, or Duke Energy and their coal ash pits. You look back over the last 100 years, and fewer than a handful of the Fortune 500 still exist. Why do businesses perish in less than a century? I would argue that most of them (A) either don’t remain relevant in serving their community and their consumer or (B) lose their way in terms of morals, ethics, and purpose. How Long Should a Mission Statement Be? Your company’s core mission should never change. It doesn’t matter if your company grows from a garage to a Googleplex. It doesn’t matter if you pivot from a piano company to a motorcycle manufacturer. The thing that can change is how you deliver on your mission, but not the mission itself. Airbnb: Airbnb exists to create a world where anyone can belong anywhere, providing healthy travel that is local, authentic, diverse, inclusive and sustainable. Can you see how both companies have stuck with their missions, despite huge transformations in their size and business models? Amazon started out as a website that sold discounted books, DVDs, and CDs. Now it’s the world’s largest ecommerce and cloud computing platform in the world. But the Amazon mission for best prices, selection, and convenience has never changed. Meanwhile, Airbnb started out as a couple of dudes renting air mattresses on their living room floor to conference-goers who couldn’t get hotel rooms. Now, Airbnb has changed the face of the hospitality industry with hosts in 81,000 cities renting to millions of users worldwide. But are they still delivering on their mission to provide “healthy travel that is local, authentic, diverse, inclusive and sustainable”? By now, the importance of a strong, achievable mission statement should be clear. The good news is, it doesn’t have to be complicated to create important things. Your mission as a company is to solve a problem for someone. Your solutions can come in the form of products, services, platforms, organizations…the sky’s the limit. When you tie the purpose of your company to solving a problem, you open up opportunities to innovate and evolve as you come up with more and more solutions. LinkedIn, for example, started in 2003 as a closed network for professionals (no public profiles back then). As the years went by, they added more ways to achieve their mission and now the profiles are just a fraction of LinkedIn’s ecosystem. Companies use LinkedIn tools for recruiting, training, and sales. Your mission as a company is to deliver a certain kind of product. Companies with product-driven missions often have a dedication to quality and the methodology behind making their products. Just remember, products have short life cycles. If you tie your company’s mission and longevity to making a certain kind of product, you are going to have to constantly up your game by releasing newer, better versions. Let’s examine one not-so-good mission statement that could use a little help answering the Three Key Questions. The following mission statement is for a major company. I’ll reveal its identity in a moment. Okay. I have a few questions. Let’s say we’re at a networking event, schmoozing and exchanging business cards and whatnot. The founder of this company approaches and introduces himself. As you can see, I’m not a fan of this mission statement. It only answers one question, and vaguely at that. Hey, at least they didn’t use “synergy” in the sentence (eyeroll). In response to the revelation that his company knowingly shared user information with shady political strategy firm Cambridge Analytica, Facebook CEO Mark Zuckerberg announced to the world that going forward, “giving people the power to build community and bring the world closer together” would be their new mission. By not answering “Who you do it for?” you’re refusing to make promises to your customers (the people who pay for Facebook ads) and your users (the people who use Facebook to connect with friends, and click on Facebook ads). When you don’t answer “How you do it?” you’re refusing to honor the values that your customers and users care about (like privacy…integrity…safety…). And without those answers to guide you and anchor you to your promise, you’re easily blown off course. In the aftermath of Facebook violating the privacy of millions of users—not to mention enabling the spread of misinformation designed to divide people over political ideology—you’d think they’d be clearer about how they plan on going about their newly envisioned mission. In the meantime, a 2019 study by Edison Research reveals that Facebook is losing US users by the millions. Looks like people are finding the power to build their communities elsewhere. Most mission statements are full of blah truisms and are anything but inspirational. A company’s employees don’t really need to be told that ‘The mission of XYZ Widgets is to make the best widgets in the world while providing excellent service.’ They must think, ‘As opposed to what? Making the worst widgets and offering the lousiest service?’ Such statements show that management lacks imagination, and perhaps in some cases, direction. The above quote is from a 2013 Facebook post by Virgin founder Richard Branson. He observed that mission statements can be empty if people put more thought into writing what their mission is than carrying it out. Let’s take a look at a few companies that live by their mission statements with every step they take. Notice that this mission statement communicates the values that drive the mission. Saying what you believe in is a powerful way to communicate why you care about your mission. It proves to your customer that you’re committed to helping them live their values through your offerings. They could have easily said “to sell organic body care products,” and that would be that. Question answered. But All Good’s target customer isn’t looking for just any old lotion. They’re looking for the kind of body care products that will support their lifestyles. I think they could be a bit more explicit about who their products are for, but the above statement implies that All Good products are for anyone who has an active, healthy lifestyle (including families with kids). We’re here to serve health- and earth-conscious people and their families. With a head-to-toe range of body care products–from kid and baby-friendly chemical-free zinc sunscreens to muscle recovery sprays, silky-smooth lip balms and sumptuous coconut oils, All Good has you covered throughout the pain and pleasure of an active life. Born from Elemental Herbs, All Good’s mission is, and always will be, to offer health- and earth-conscious families the purest, most elemental ingredients and organic herbs in natural healing products that are good for people and good for the planet. It’s just a little tweak, but it brings their purpose and target customer into crystal-clear focus. Well, that was easy. Can’t get more straightforward than that. All Good is a purpose-driven company, so their mission statement is central to how they operate. Getting it right is fundamental to their success and growth. 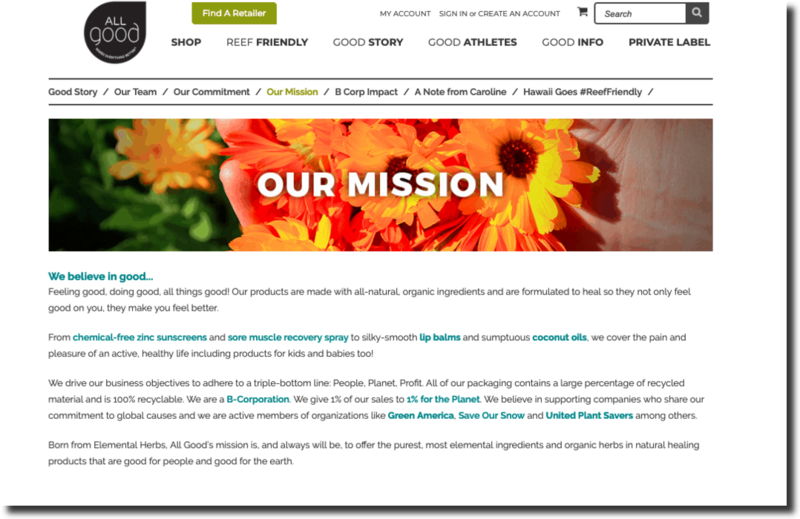 No wonder they’ve been recognized as a B Corp Best For The World company for a deep commitment to serving people and the planet while making a profit. We work…to inspire responsible leadership, foster diversity and collaboration, build resilience, create new business opportunities and unleash…potential. …they answer that by inviting you to click the “Learn How” button. This simple mission statement from shoe-seller Rothy’s answers all Three Key Questions with clarity. …create a new kind of shoe…one that is versatile, chic and durable. Can they get a little more descriptive here? Sure. After all, women aren’t a monolith. With as little waste and impact to the environment as possible. Now that you’ve seen a few examples of simple but powerful mission statements, let’s discuss what makes a great vision statement. What will having a vision statement do for your business? When you help others see the world that you seek to create with your products or services, you’ll inspire them to roll up their sleeves to help you get there. That means a strong vision statement will gain buy-in from all stakeholders, from investors and board members to employees and customers. And when everyone involved shares a vision, the mission is a lot easier to accomplish. Why do we need a vision statement? Let’s say you’ve been sailing across the ocean for weeks and you finally spot land on the horizon. That island is your vision statement: it’s the destination of your mission. Every worthwhile endeavor, whether it’s a race to put the first human on the moon or a company that seeks to outfit adventurers while protecting the environment, has a clear, shared vision of success that rallies a team to work toward making it happen. How can you track your progress toward your vision? The North Star Metric (NSM) is a powerful concept that has emerged in recent years from Silicon Valley companies with breakout growth. It helps teams move beyond driving fleeting, surface-level growth to instead focus on generating long-term retained customer growth,” Ellis says. “To uncover your North Star Metric you must understand the value your most loyal customers get from using your product. Then you should try to quantify this value in a single metric. For example, Philippines-based HR platform Sprout, whose vision is to help transform the developing world into a robust economy, uses their customer satisfaction score as their North Star Metric. Can’t a mission statement exist without a vision statement? Well…yes. But having a mission without a vision would literally defeat its purpose. Imagine that you’re about to get on a plane. The airplane’s purpose or mission is to use the latest technology in aeronautics to carry lots of people to faraway places in the safest possible way. But…when you look at your plane ticket, there’s no destination. Also, the pilot’s navigation system in the cockpit is missing. Would you get on that plane? That’s what a business mission without a vision is like: a powerful vehicle with no idea where it’s going or how it’s going to get there. Microlender Kiva lays out a clear-eyed view of what will happen when they accomplish their mission. Entertaining everyone and making the world smile. Changing how people feel and giving us common ground. Facebook has confused their vision for their mission. A world that’s closer together. People lack the power to build communities. The world is divided. Wow…Facebook’s vision is wonderful. Now they just need to develop a mission to get there that works for everyone. What is Your Vision for Change—and How Will You Make it Happen? Now that you have the tools you need to craft mission and vision statements that will drive you to build your products, market your services, and grow your company, share what you come up with in the comments below! What’s your mission? Your vision? Alaura Weaver is a story-based copywriter and content strategist for SaaS and subscription services. She works with conscious startups to create emotional, conversion-driven connections with their fellow human beings. Alaura is a Hubspot and Copyblogger certified content marketing strategist. Her writing on B2B SaaS growth, ethical marketing for social good, and social equality has been featured in Huffington Post, Copy Hackers, Copyblogger, Conscious Company, and Art + Marketing. Want to connect? You can find her on LinkedIn, Twitter and Medium. Want to make a stand with your brand? Learn more at www.wordweaverfreelance.com.